What’s the Easiest Way to Learn Korean? What is best way to learn Korean? The best way to learn Korean is to start with the alphabet? The easiest way to learn Korean alphabet is to mimic human sounds. The Korean alphabet is known as the Hangul. The Hangul is the key to the easiest way to learn Korean. The Hangul consists of fourteen consonants and ten vowels. The history of the Hangul dates back to the Joseon Dynasty in the 15th century AD. The Korean alphabet mimics almost every human sound which makes it super easy to learn. It is said to start here if you are interested in how to learn Korean fast for beginners? The bases of the Korean alphabet was developed for fundamentally reading in the Korean language. A lot of people tend to find it easier to pronounce Korean words by using the Roman alphabet. However, many tend to develop the understanding that that isn’t an effective approach. The quicker you learn the Korean alphabet that’s the easiest way to learn the Korean language. So, for those who ask how to learn Korean on your own; the easiest and fastest way to learn Korean is practice, practice, and more practice! The best way to master the Hangul is to memorize all the symbols and pronunciations that are associated with them. Research has shown that handwriting the characters while enunciating the sounds associated with them helps to develop an audiovisual connection within the human brain. An audiovisual connection is a process of processing both a sound while observing a visual component. By during this you are exercising and developing your brain in multiple ways by using multiple pathways. The continuous practice of the Korean alphabet makes your memory develop a lot faster when it comes to learning anything new. With that being said, there are levels to learning or stages in the learning process. #1 – The best way to learn Korean is to use a visual aid such as a movie poster. Studies have shown that the best way to learn Korean for beginners is to use Korean movie posters. The way you use them is by reading the word out loud. Many people ask how can I learn Korean by myself this is an easy and fun way. #2 – How to learn Korean fast by yourself? Once you have master step one, you now want to start spending 5-10 minutes daily reading full forms of Korean text. The key is to continue to develop an audiovisual connection by reading the text aloud. As a beginner, you want to start with texts you can completely understand at first such as children books; this is the easy way to learn Korean grammar and it’s also how to learn Korean without classes. The best way to learn Korean for beginners is to start here and then progress on to more complex forms of texts. So, when you ask the question what to do to learn Korean? The answer is to follow these steps to learn Korean fast. #3 – Step three is for advanced learners. You want to start exploring more complex forms of the Korean language such as music videos and novels. Once you reach this step the goal is to learn to read fast and accurately. Following these simple steps, you will quickly learn that this is the easiest and fastest way to learn Korean as well as the best way to learn Korean on your own. Research shows that the easiest way to learn Korean language is used the above mention tips to learn Korean fast. So, for those who ever found themselves asking any of the following questions: How can I learn Korean by myself? What to do to learn Korean? How to learn Korean in a week? How to learn Korean without classes? Or what is best way to learn Korean? What’s the easiest way to learn Korean? The answer can be found in the above mention outlined steps. 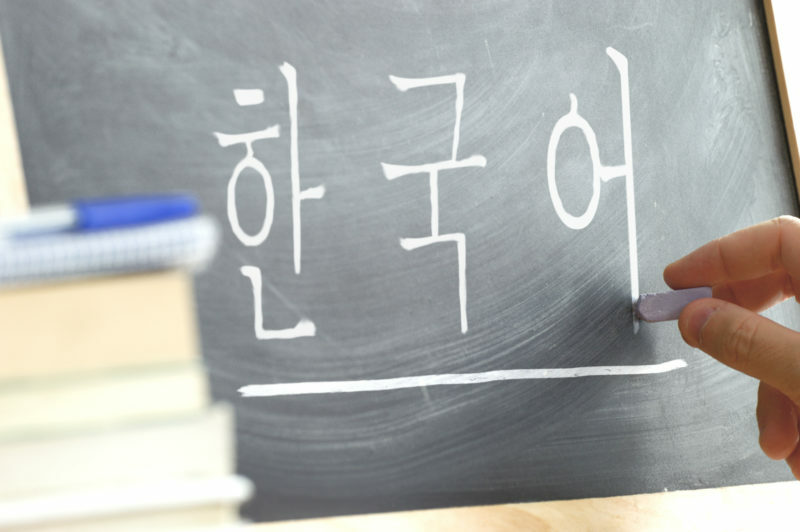 The process of learning the Korean language doesn’t have to be a difficult one. The easiest way to learn Korean language is to start with the Hangul. The Hangul is the key to the easiest way to learn Korean through mastering the characters and sounds of the alphabet. Mastering the alphabet is an easy way to learn Korean grammar. The trick to being successful in the Korean language is to have great resources. Good resources could be the difference maker in you becoming fluent in the Korean language. You can find resources online. A great resource to use is the Hangul Wikipedia page. It’s easy to get overwhelmed with the content. If so, there are some websites out there that offer mini-lessons in the Korean language such Learnlangs; an option for individuals who are looking for the easiest way to learn Korean alphabet or how to learn Korean fast for beginners. Using websites like those is the best way to learn Korean book and the best way to learn Korean language. The right material influence how to learn Korean on your own as well as what’s the best way to learn Korean. So, how does it work? Study! Use the given lesson plans to fully emerge yourself into the content. The objective is to make new knowledge active not passive. It’s best to vocalize what you’re learning as well as processing for understanding. You want to be able to effectively communicate. Become habitual! You should take time out of every day to review and learn a new topic. Repetition is key to being able to memorize and learn any form of new information. Take Notes! When learning anything new, there will be new elements to process and they may take some time to grasp. So, that’s why notes are helpful. So, when trying to become fluent in Korean the best way to learn Korean on your own and how to learn Korean fast by yourself you should have great resources, study, and be sure to expose yourself to new topics and lessons on a daily basis. Start with learning the Hangul which is the best way to learn Korean language through the alphabet. Engage deeply in the pronunciations as they mimic human sounds. What’s the best way to learn Korean is to start small with texts like movie posters and work your way up. Working your way up is the best way to learn Korean book.